Ever since I decided to start detoxing my makeup bag, finding an everyday foundation without parabens, mineral oil, phthlates, sodium lauryl sulfate, and gluten has been a priority for me. I feel like the makeup that covers the majority of my face and pores should not only provide flawless coverage but also offer skincare benefits for my face. When I first started this journey, it was almost impossible for me to find a foundation that matched my dark-complexioned-yellow-undertoned skin (without looking ashy or muddy) but in the past few years so many more options have been introduced to the cosmetics department. YAY!!! Tarte was already one of my favorite brands (since 2005) and I had been wanting to try their Amazonian Clay Airbrush Foundation and Airbuki brush since I saw it at Sephora in late 2013. Seeing it for a special price on QVC a few weeks ago was all the encouragement I needed to finally try it for myself. In the past, I always wore my non-toxic makeup on weekdays and my Make Up Forever foundation for events/weekends but I love the Tarte Amazonian Clay Airbrush Foundation so much that it has been the only foundation I’ve used since I received it 10 days ago. 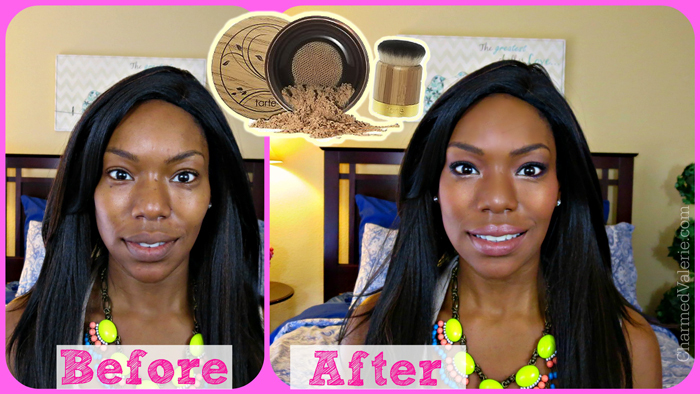 Clearly, I’m wearing more than just foundation in the “after” picture so I filmed a Get Ready With Me video to walk you through my general everyday makeup process and show you a few other products that have stolen my heart lately. The things I love about Tarte’s Amazonian Clay Airbrush Foundation are that even though it’s a powder, my skin still looks like gorgeous, radiant skin (instead of that matte, cakey, corpse-ish look that powder foundations are prone to). I also love that it stays on all day, it’s lightweight and I can’t feel it on my skin, and it has all sorts of anti-aging goodness in it’s formulation. Oh yeah and the packaging is genius. The mesh-delivery system disperses the exact amount of product you need. A total WIN all around. I will definitely be buying this again. What I’m Wearing Outfit post/pictures. Let me know what you think, foundation suggestions, or anything else in the comments below! Also, I’m planning to film at least 2 videos a week and would seriously appreciate your suggestions/questions for the type of content you’d like to see me cover.